What do you do when talking turns tough? When conversations become crucial—when the stakes grow high, opinions differ, and emotions run strong—what tactics do you typically revert to in order to navigate the discussion effectively? Are you a masterful communicator or a danger to dialogue? Take the following quiz to find out your style under stress and learn what skills and tactics you need to master in order to improve the way you communicate in even the most crucial conversations. Relationship. Before you get started, think about the relationship you want to improve—with your boss, coworker, direct report, friend, or family member—and keep this relationship in mind. Circumstance. Next, think of a tough situation—one that you might have handled poorly or avoided altogether. Apply. Now, with that situation in mind, respond to the following statements as either true or false. T F (Violence) When arguments get really heated there are times when I exaggerate my view, use harsh expression such as “that’s ridiculous!,” or I might even say things that hurt the other person. T F (Silence) At times rather than share my honest view, I use sarcasm to make my point, hold back my opinion altogether, or I might even avoid people rather than get into an argument. T F (Start with Heart) When I really get into an argument, sometimes I get so caught up in the heat of the moment that I move from trying to respectfully make my point to trying to win or maybe even discredit the other person. T F (Learn to Look) In the middle of a tough conversation, I occasionally get so caught up in arguments that I miss how I’m coming across to others and fail to step back and adjust my verbal strategy. T F (Explore) When others appear hesitant to speak their honest view about a difficult or controversial topic, I don’t try to get them to open up, instead I either continue with my views or change the subject. T F (Make It Safe) When I find that I’m at cross purposes with someone, I often push ahead and keep trying to win my argument rather than looking for common ground or maybe even apologizing for being too forceful. T F (Master My Stories) When a conversation goes poorly, I’m more inclined to see the mistakes others made than notice my own role. T F (Move to Action) When finishing up a high-stakes and emotional conversation there have been times when I don’t complete the discussion by clarifying who will do what by when or identifying who has what decision authority. T F (Overall) When stakes are high, emotions run strong, and I really want to make sure my opinion is heard, I tend to get caught up in the moment and end up being more on my worst behavior than I am on my best behavior. 9 – 10 Dialogue wonder. Keep it up. 7 – 9 Good Job, but you can still use some work. Brush up on your crucial conversations skills. 4 – 7 In need of skills. You’re about average, so improving you crucial conversations could help you get unstuck. 0 – 3 Don’t leave the house. Before you do anything else, learn how to hold crucial conversations. © 2009 VitalSmarts. All Rights Reserved. VitalSmarts, Crucial, Crucial Skills, and Style Under Stress are trademarks and Crucial Conversations is a registered trademark of VitalSmarts, L.C. This award-winning team of authors has produced three New York Times bestsellers, Crucial Conversations: Tools for Talking When Stakes are High (2002), Crucial Confrontations: Tools for Resolving Broken Promises, Violated Expectations, and Bad Behavior (2005), and Influencer: The Power to Change Anything (2007). Kerry Patterson has authored award-winning training programs and led multiple long-term change efforts. He received the prestigious 2004 BYU Marriott School of Management Dyer Award for outstanding contribution in organizational behavior. He did doctoral work in organizational behavior at Stanford University. Joseph Grenny is an acclaimed keynote speaker and consultant who has designed and implemented major corporate change initiatives for the past 20 years. He is also a cofounder of Unitus, a nonprofit organization that helps the world’s poor achieve economic self-reliance. Ron McMillan is a sought-after speaker and consultant. He cofounded the Covey Leadership Center, where he served as vice president of research and development. He has worked with leaders ranging from first-level managers to corporate executives on topics such as leadership and team development. Al Switzler is a renowned consultant and speaker who has directed training and management initiatives with dozens of Fortune 500 companies worldwide. He is on the faculty of the Executive Development Center at the University of Michigan. 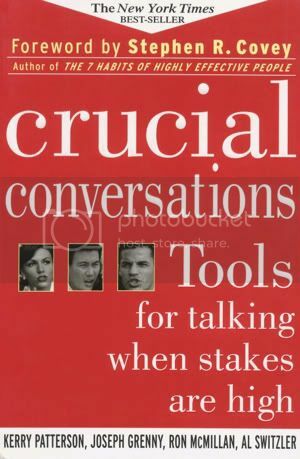 We have one (1) copy of Crucial Conversations: Tools for Talking When Stakes are High to give away to one luky reader. This contest ends TODAY Thursday, June 11th at 11:59pm (pdst) so don't wait - make sure you've gotten all seven entries TODAY! Please note: entries received after the cutoff time will be deleted prior to drawing a winner. This sounds like a good book to have. I don't have a teenager, but I'd love to win. I could really use this. My teenager is driving me nuts because he is stupborn and won't listen to anyone but his "friends." I think that the comment about teenager was for prior contest. I'll comment about this giveaway's prize. I started taking that quiz, but I knew answering honestly would make me look bad! So, to be honest, I really need this book so I can read it and apply its principles to my life! My teenagers don't listen or want to help out. This sounds like a good book to have 4 my daughterinlaw who is raising 4 boys. My tween thinks she is a teen. I joined your social network under the name Lily Kwan.